A presentation on the findings of a recent study on gender integration in agriculture and natural resources in Tanzania spurred a heated debate among the country’s policymakers and clearly showed that their understanding of gender issues was limited. 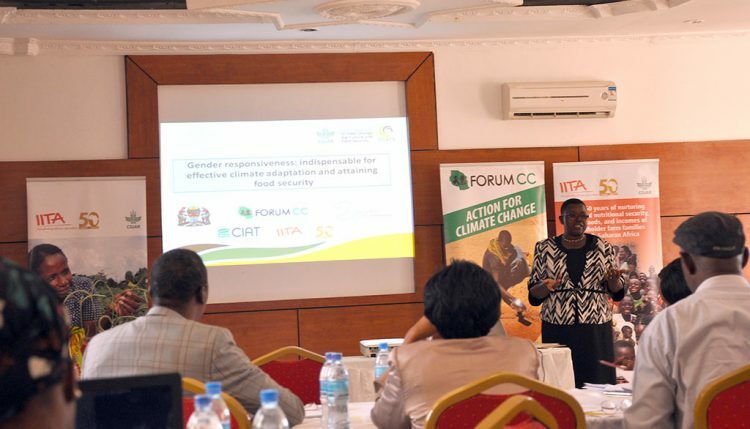 One of the key follow up actions agreed upon was a request by the Tanzania Parliament for training on how gender issues are related to the environment, climate change, and food security. The training will be organized in November 2017 when Parliament resumes. Edidah Ampaire presenting the findings to the policymakers. The findings of the study, which highlighted the status of gender integration and gender budgets in Tanzania’s natural resource, agriculture, and climate change policies, strategies, and implementation plans, were presented by a team of researchers from IITA and their partners from the Tanzanian Ministry of Agriculture, Livestock and Fisheries (MALF) and the Tanzania Civil Society Forum on Climate Change (FORUMCC) on 13 September. The study found that although positive progress had been made over the years in integrating gender in policies, the degree of intervention and the interventions were mainly superficial and little attention had been paid to addressing causes of structural inequalities and power dynamics that left women vulnerable to climate change. In addition, a limited and inconsistent budget had been allocated for gender-related activities and practitioners had limited knowledge and skills for conducting gender analysis and addressing gender issues. The findings were received with mixed reactions from the legislators, initially showing a gender-based divide in perceptions. The male MPs queried the relevance and necessity of gender responsiveness, whereas their female counterparts voiced their support for the need to address gender issues in climate change adaptation, agriculture, and policy and the benefits it can bring. The ensuing heated debate diverted the focus of the study, until the opposition shadow minister for agriculture, Hon. Magdalena Sakaya, used her technical expertise to bring some order. She pleaded with the MPs in attendance to focus on the findings of the study. “What I see is a scientific study that clearly shows the findings about our national policies. It shows what we have done well and the gaps that need to be filled. What we need to do is develop and implement strategies to close the highlighted gaps, and I think [that] is clear,” she said. She was followed by the woman representative for Geita region, who gave a practical example on the need to address gender issues from the region: “I come from Geita, and this is what I see: there is food shortage during the drought period and men migrate to townships for up to eight months. Women shoulder the responsibility of feeding their families, including looking for fuel wood or charcoal, and water. … Under such circumstances, women should not only be sensitized about climate change and the environment but should be supported [to] improve the livelihoods of their families,” she said. The discussions that followed the two submissions suggested that the message had been understood as participants started to appreciate that gender mattered and should be considered in policy making. Through the committee chair, members of Parliament requested the team to organize a capacity building session for them in the next parliamentary session in November focusing on climate change, food security, gender, and the environment and how these topics are interrelated. “One lesson learnt from the event is that gender is still a controversial topic for policymakers in the country. 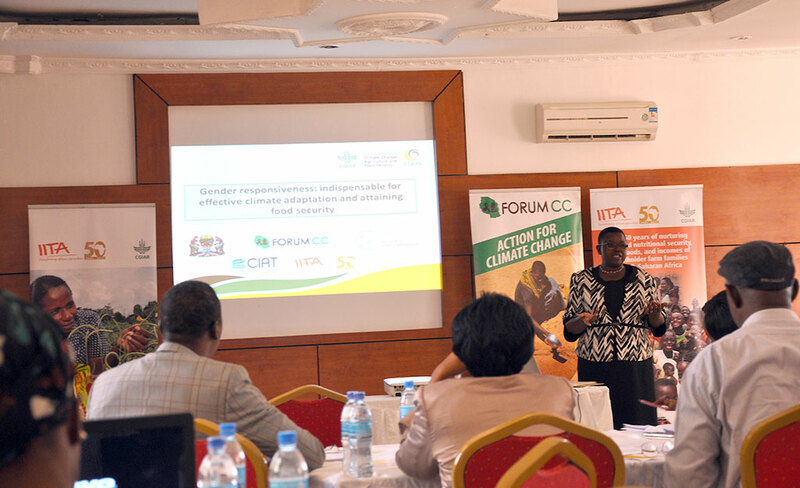 There is an apparent need to create awareness among policy decision makers as well as build capacity of practitioners to address issues of gender inequality,” said Edidah Ampaire, Project Leader for the Policy Action for Climate Change Adaptation (PACCA) and who led the research project and was part of the team. Other team members included Perez Muchunguzi, a Multistakeholder Specialist at IITA Uganda; Issa Fazal, Program Officer at FORUMCC; and Natai Shakwaanande, Head of the Environment Management Unit in Tanzania’s MALF. The policy engagement was attended by about 35 members of the Tanzania Parliament and nine non-parliamentarians. MPs included members of the standing committees on agriculture, the environment, budget, and constitution, law, and governance, and representatives from the parliamentary youth and women groups. The activity is part of PACCA, an initiative of the CCGIAR program on Climate Change Agriculture and Food Security (CCAFS). Read more in a blog on the session: Capacity building is a prerequisite to advocacy: An experience from Tanzania.